Popularity of online shops grows instantly and proportionally increases the number of Joomla eCommerce software. How to choose the best Joomla shopping cart among tons of available options? This post will show you top extensions and uncover their details and peculiarities. Sit tight, we’re gonna expose the best Joomla eCommerce plugin. Which is the best Joomla Shopping Cart? Joomla has dozens of eCommerce plugins. We’re going to figure out the 5 most popular extensions and look more deeply on what they can offer to you. VirtueMart is the most popular free open-source eCommerce solution for Joomla that covers more than 74, 851 live websites according to builtwith.com statistics. Lots of users prefer it over any other Joomla eCommerce software. Due to the same research of the shopping cart, we can learn that VirtueMart is popular all over the world (see the chart below). VirtueMart provides users with extensive features, suitable to create competitive e-store. Additionally, you are welcome to extend your online shop possibilities with many plugins, components, modules and templates available on extensions.virtuemart.net. Having clear architecture and being easy to customize, VirtueMart is considered to be the best Joomla shopping cart during many years. It can satisfy all your needs when starting selling online. VirtueMart functionality includes all basic eCommerce features. VirtueMart is relatively easy to use, though if you are not a tech-savvy, you may face some difficulties and require developer’s help to initial installations and going deep into the source code. But that is familiar to owners of open-source solutions. One of strong points of VirtueMart is it’s community support and forums. Usually when google your issue you are happy to notice that people have already discussed it and solved. VirtueMart enables you to add unlimited items to your store, including products, categories and attributes listings. This best Joomla eCommerce software offers many useful out-of-the-box features e.g orders tracking, multiple currencies, custom attributes, guest check-out, multilanguage etc. Moreover, price display can be changed due to shopper groups, that’s good. VirtueMart provides merchants with couple of payment gateways. You can make transactions via PayPal, SystemPay, cash on delivery, etc. Since, this solution is PCI compliant, your customers can use credit cards being sure their personal data is in safe. Inbuild VirtueMart marketing tools include coupon codes, discounts, product reviews and ratings. Anything else is available via third-party modules. As best Joomla eCommerce plugin VirtueMart is SEF/SEO integrated by default. VirtueMart is very popular eCommerce solution and due to builtwith.com statistics. Since 2011 till now, most frequently users are switching to VirtueMart from world's leading open-source platforms: OpenCart, PrestaShop and Magento ( see the chart below). 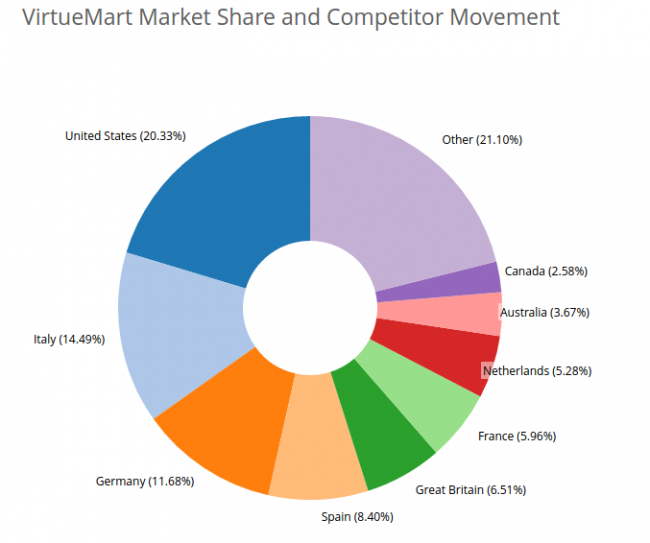 Such migration trends show that VirtueMart offers everything needed to sell online efficiently and it is worth paying attention too. If you want to switch your current store to this robust eCommerce solution - try automated data migration with Cart2Cart. Believe me, you’ll never regret. Migration process is effortless - register a new account and perform 3 simple steps: Setup Source and Target Cart, Demo migration, Full data migration and you’re a lucky Virtuemart store owner. 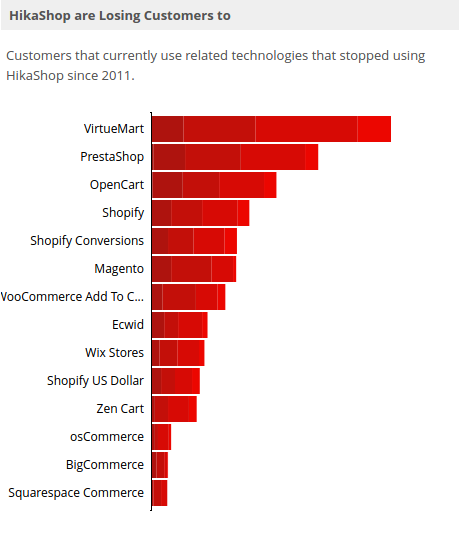 Among other Joomla eCommerce software, it is reasonable to mention HikaShop. According to builtwith.com it runs 39,302 live websites. This extension stays popular thanks to many efficient marketing tools that it offers (affiliate program, coupon codes, discounts, etc.) and powerful statistics displayable on your dashboard to facilitate store managing. If you are in search of simplicity along with flexibility, HikaShop is your best eCommerce plugin for Joomla. With this solution you will always go in feet with time, offering users competitive services. HikaShop has 3 pricing plans: Starter (free), Essential (€49.95) and Business (€ 99,90). It provides store owners with more than 70 payment plugins and it highly customizable in checkout process (workflow and layouts). Checkout steps are shortened as much as possible to grow order conversions. This Joomla eCommerce software is easy to setup and use. Though, to be honest, it lacks some features that may not be essential but able to boost your store performance. You know how hard it is to convert your site visitors into customers and some advanced functionality will never be needless. Not rich assortment of tools could be one of the reasons, while store owners are changing this solution to more robust ones - VirtueMart, PrestaShop, OpenCart. (see the chart from builtwith.com below). HikaShop could be the best Joomla shopping cart for non-developers, starters who aim to maintain a small or medium sized store and don’t need a wide range of features. HikaShop design is quite basic and you need to go with commercial plans and learn some CSS and HTML to tweak it around. But if you’re not expecting something astonishing from your store’s look and don’t need wide range of advanced tools - HikaShop is the best eCommerce plugin for Joomla you can find. Eshop is another popular Joomla eCommerce software with 37,931 live websites according to builtwith.com statistics. It is a powerful and responsive extension with many effective features. What makes it among best Joomla eCommerce plugin is the complete user-friendliness and ease of customization. Eshop is simple to install, add products, payment and shipping plugins and enable built-in modules. Ready to accept orders? As best shopping cart for Joomla, Eshop offers more than 45 payment gateways and 10+ shipping methods along with comfortable one page checkout. 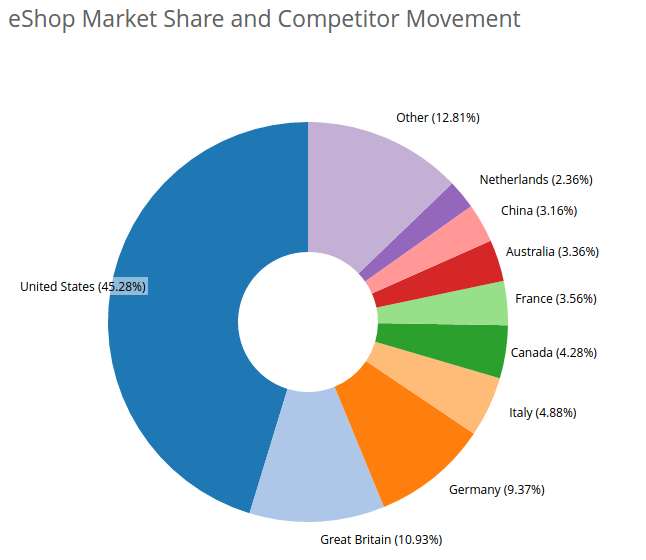 This Joomla eCommerce software is mostly used in United States due to builtwith.com research (see the chart below). Eshop offers high-level flexibility along with a variety of functions designed to make the site work to its fullest. It makes Eshop best Joomla shopping cart even to demanding store owners. 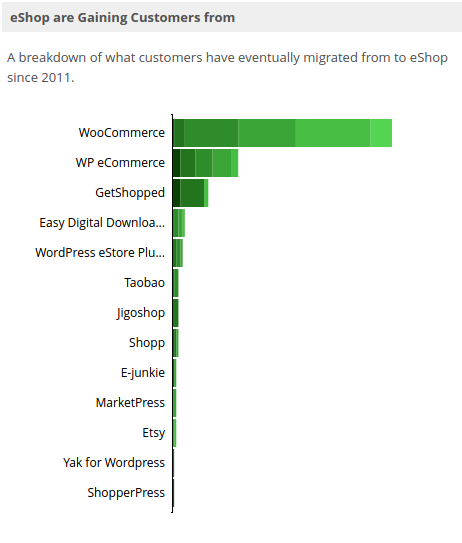 Maybe ease of store customization and attractive layouts combined with variety of tools are the features that make store owners switch to Eshop from other popular platforms e.g WooCommerce and WP eCommerce (look up the migration stats below). This solution also offers solid documentation and support service to solve your troubles. Moreover, Eshop allows you to create products, categories etc. in different languages. If you add Association Multiple Languages feature your customers will be able to switch language on any page of your store. JooCart is a standalone component that includes OpenCart features and stands out as one of best eCommerce plugin for Joomla. This effective solution gives merchants the ability to create online businesses and sell online at a minimal cost. JooCart is designed as SEO-friendly shopping cart and it enables you to add unlimited products, categories and manufacturers. The main advantage of this Joomla eCommerce software is OpenCart integration - old and new OpenCart extensions can be used as Joomla modules and you can manage OpenCart configuration from Joomla admin panel. Isn’t it awesome? Two feature-rich platforms in one looks like a lucky ticket! JooCart provides users with 20+ payment gateways and 8+ shipping methods and guest checkout (customers don’t need to sign up for an account and can enter minimum personal data to make a purchase). What makes JooCart among the best Joomla eCommerce software is the sales reports functionality. You will receive 3 types of records - Sales Report, Products Viewed and Products Purchased. This feature will give you full control over what’s going on in your store. You will be able to calculate the total amount of sales per day, month or week. Additionally, you will see what products are mostly viewed by customers and what they are buying. Properly using the gathered information you can plan better your future marketing campaigns and boost sales. J2Store closes the list of best Joomla eCommerce software. This effective solution is easy to install and operate. It enables you to sell both physical and downloadable(digital) items and offers various product options and variants. J2Store is considered to be best Joomla shopping cart by lots of users. This advanced extension can simultaneously turn your thoughts into sales thanks to its efficient functionality. J2Store integrates with articles by adding eCommerce feature and allowing you to sell online straightforward. 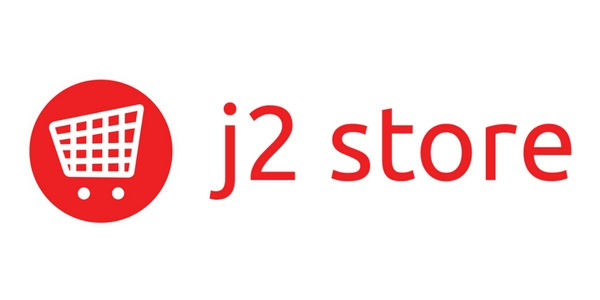 J2Store is created to make online retailing simple for you. Some of key features include stock management, multiple shipping methods, multi-currency, orders management, professional technical support, integrated currency conversion and many others. It also makes your transactions easier by dealing with most popular payment gateways (PayPal, Authorize.net etc.). If you are in search of responsive, professional and user-friendly solution to run your e-business - J2Store is the best shopping cart for Joomla! What’s the outcome? What’s the best Joomla eCommerce plugin? Nobody to deny that the choice is yours. Compare all of the described features of top Joomla extensions and decide what’s your perfect match. Every of them has its advantages and disadvantages, but all are worth paying attention to. We believe you’ll be wise and unprecedented while picking your best shopping cart for Joomla. Not to be ungrounded, according to our research the total winner and best shopping cart for Joomla is (drum roll) VirtueMart. Even though it has some limitations, this is the only Joomla eCommerce solution whose popularity is increasing day-to-day. It is an easy way to convert your Joomla site into efficient eCommerce store. It can’t be neglected that VirtueMart comes with many useful out-of-the-box features that make selling online an enjoyable experience to both merchants and customers. Being user-friendly it can be a good choice to those just entering eCommerce industry. If you feel that you are to move your store to VirtueMart - we have a solution to your request! Cart2Cart migration service can import to VirtueMart all your eCommerce data from any of 75+ supported shopping carts automatically. Give a new breath to your store and try our Free Demo. Your business’ success is in your hands! Make the right choice. 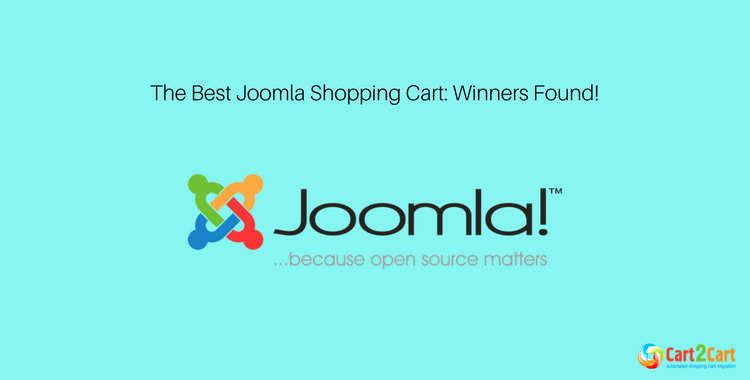 One thought on "The Best Joomla Shopping Cart: Winners Found!"